From its burnished leather upper to its vintage-inspired buckles, the Earth® Larch is a wardrobe essential for the fall season and beyond. 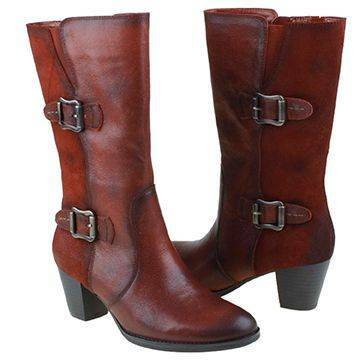 Sporting a 2 ½” heel, this mid-calf boot adds polish to any look. Available in black, taupe, and bordeaux, Earth’s Larch boot bridges the seasons with its contemporary, modern style. But this new boot offers more than just fashionable looks. Beneath its stylish, tumbled leather exterior lies an abundance of comfort features designed to keep on-the-go fashionistas–or even those experiencing foot pain–comfortable and well supported all day. Earth’s premium leather linings bathe the foot in luxurious comfort. This softness inside the boot helps to prevent skin irritation. The smooth interior also makes Larch an excellent choice for those with corns, calluses or sensitive skin. Further boosting Larch’s comfort factor is Earth’s exclusive comfort footbed. Loaded with comfort features, this exclusive footbed heightens comfort and works to help those experiencing foot pain from plantar fasciitis and other foot ailments. High-density, molded polyurethane foam cushions the feet from heel to toe. Far from just another comfort feature, this cushioning also helps those with ball-of-foot pain, like Morton’s neuroma or metatalsargia. An over-padded heel area helps to displace shock. This additional padding can also help those with heel spurs and other foot conditions. Reinforced arch supports work to support and stabilize the foot. A full leather sock lining enhances breathability, helping feet to stay comfortable all day. Though it provides enhanced comfort and support for just about anyone, Earth’s exclusive comfort footbed can benefit those with foot conditions like plantar fasciitis heel pain, pronation, and other foot problems. A firm heel counter helps control the motion of the foot, adding even more stability. Coupled with Earth’s arch supports, this feature helps to control pronation, a well-known contributing factor in a number of other foot conditions. 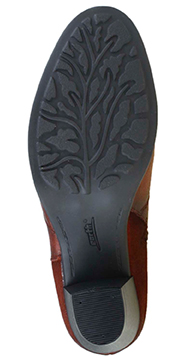 Larch’s durable, rubber outsole features a sculptural, nature-inspired tread that helps improve slip resistance. Rigidness in the middle of the outsole provides added support for the midfoot. 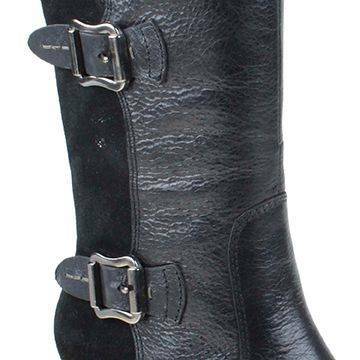 Slipping in and out of this boot is easy thanks to a convenient side zipper. And elastic goring inserts at the top help to ensure a more comfortable fit around the calf while allowing freer movement. You’ll find Earth’s Larch at Lucky Feet Shoes. Come in today and try on a pair at one of our five locations in Anaheim Hills, Rancho Cucamonga, Riverside, San Dimas or Temecula. Larch is also available on our website, along with many other styles you’ll love! See the complete line of available Earth footwear or shop for Larch now!